Made up of cotton satin. Decorated with zari and lace. Wash with normal water without detergent. Size of the products: 210 cm (L) x 34 cm (W). Kumkum pagla is a part of Indian wedding. 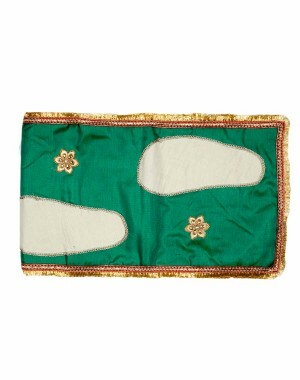 This readymade kumkum pagla is mostly used when bride come for the first time. Decorated with stone and lace. can be arranged next to the door so the bride comes in the home through this kumkum pagla. It is used in traditional wedding or in engagement ceremony.